So, I have this problem. Whenever a new show comes out on Netflix and I fall in love with it I binge watch it. Episode after episode I spend with my face lit up by the ambient glow of my macbook. 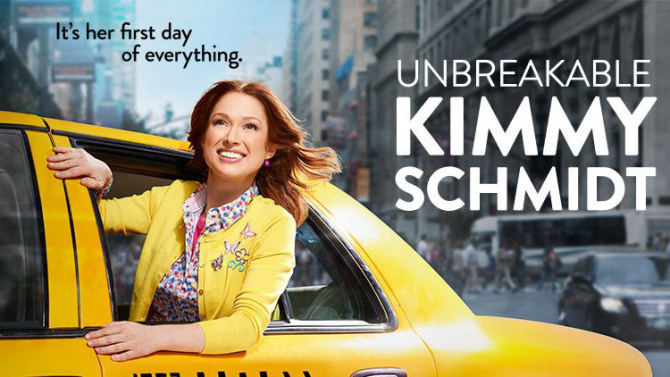 I had seen previews for Unbreakable Kimmy Schmidt a few weeks prior to its release and thought hey, that could be good. I always enjoyed Ellie Kemper on The Office with her quirky antics so I figured I’d give it a try and watch. Well, just a few short days later here I am and I finished the first season already. So it should come as no surprise that I loved it! I mean why would I watch hour after hour and not, right? Ellie Kemper is nothing short of lovable as Kimmy Schmidt. A young adult who was recently rescued from an underground bunker that she was held in for 15 years with 3 other girls. After being rescued she makes an appearance on the Today show and decides to stay in New York to avoid going home and being labeled the girl that was trapped in a bunker. She quickly and hilariously lands a job as a nanny and gets an apartment. Her roommate, Titus, is a hysterical struggling actor together the pair are in two words – comedy magic! I was not surprised when I learned that Tina Fey was the creator of the show and if you enjoy her comedy you’re pretty much guaranteed to enjoy Unbreakable Kimmy Schmidt as much as I did. Not did this show keep me in stitches it had some great messages about life tied into it as well. I give it 5 stars. Definitely a new Netflix must watch!